That weather system last night was a warm front, which pushed the cold out. The warm front is now pushing east from our coastline, with clearing this morning. A breeze from the west should deliver a beautiful afternoon for most of New England. With plenty of sunshine, expect high temperature in the 60s to 70s in southern New England. Even at the ski areas we should make it into the 50s. It will be a big day at Killington for the Bear Mountain Mogul Challenge. A rather subtle cold front settles into northern New England tonight, with a few clouds. Slightly colder air arrives in northern and eastern New England tomorrow. Low temperature tonight in the 30s to low 40s. Highs tomorrow in the 50s near the shore to 60s inland. Probably close to 70° in Connecticut. Clouds race in Sunday afternoon, as yet another warm front pushes toward New England. And much like last night there will be a wintry mix developing Sunday night into Monday. It is warmer this time, and most of the snow should be confined to northern most Vermont, the mountains of New Hampshire, and much of central and northern Maine. Wind from the southeast will increase for a rather cool and raw Monday with temperatures mostly in the 40s. Rainfall amounts in excess of a half inch are possible. Our forecast for the rest of the week is a real challenge. We will have a front stall here with waves of low pressure. Each one capable of producing some southern rain, and northern wintry mix. Timing each wave from this far out is nearly impossible. 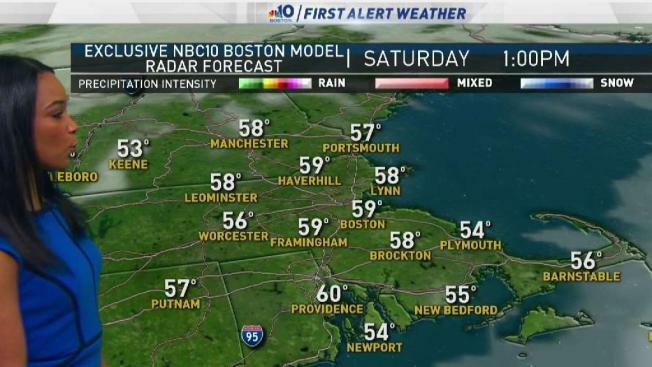 But the forecast for Fenway park opening day at 2 p.m. Tuesday afternoon will probably bring mostly cloudy skies with temperatures in the 50s. The optimistic outlook is that we may have a dry middle of the week, but then it looks like a more significant late winter storm is possible toward next weekend. Stay ahead of it all with our First Alert 10 Day Forecast.